NEW ORLEANS (CNN) -- New Orleans' historic French Quarter has survived devastating hurricanes, sweeping fires and countless Mardi Gras parties over the years. 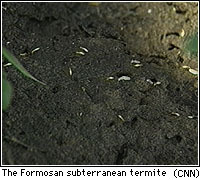 And now it's under attack from a pesky pest -- the Formosan subterranean termite. New Orleans officials estimate the termites inflict more than $300 million damage a year. About 30 to 50 percent of the city's 4,000 live oaks are believed to be infested. The Formosan termite is native to China and has been found in Japan, Guam, Sri Lanka, South Africa, Hawaii and the continental United States. It was first discovered in America at a Houston, Texas, shipyard in 1965. Within two years, the termites traveled more than 1,000 miles (1,600 km), stretching from Houston to Charleston, South Carolina. The termites move quickly from trees to homes, typically working from the ground up. They gnaw on just about anything, including concrete, bricks and mortar to get to wood. 'Within two years, your home could be destroyed,' said Prof. Gregg Henderson, a Louisiana State Univeristy professor. Termites devoured the home of John Lewis, who has spent more than $20,000 trying to repair the damages. 'The termites ate it up -- the walls, the joints, the roof. ... Everything' he said. To combat the infestation, New Orleans has embarked on an innovative and aggressive plan to root out the pests and preserve the city's historic treasures. But at a cost of $100,000 per city block, the city's greatest battle may be coming up with enough funds. Reporter Russ Jamieson contributed to this report.